Today is 3 weeks from my last surgery and I’m doing great! The bruising is almost gone. I can take full showers without getting lightheaded. I am back to sleeping on my side (with pillows between my knees). I am no longer getting up a gazillion times to pee (last night I didn’t get up at all!). I still have swelling (to be expected for months to come). I am still sore and tight but getting better. What has helped significantly is a lymphatic massage (combination of MLD and massage). That really loosened up those tight muscles especially in my hamstrings.. But huge caution… Do *NOT* get a regular massage. 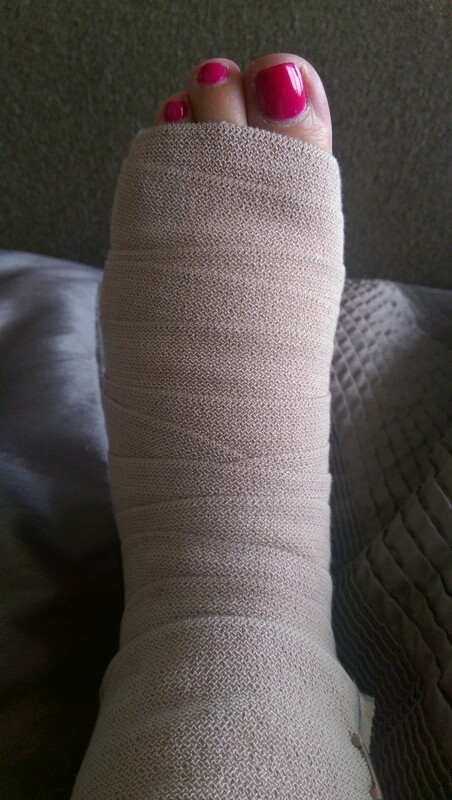 It will cause swelling and bruising (I had someone lie to me about their credentials…) That set me back. Sitting is still the devil. But after I walk around for a little bit, I’m better. I wrap my feet at night to reduce the swelling and frankly my ankles feel so refreshed after wrapping them. I went back to the gym last week. I’m traveling for work. I did get bronchitis and have had a cough for 2 weeks (everything is fine… Had a chest x-ray and lungs are fine…) just a nasty viral thing that is taking its time leaving me. It’s tapering down but has taken a huge toll on me. I’m fortunate that I did lose 15 pounds after surgery and have maintained that loss. I hope as I buckle back down and eat Paleo 99% of the time I will see more results. I never lost my appetite during this and was eating more comfort foods..I’m wearing clothes I haven’t been able to wear in a long time. But the most important things…. My feet don’t hurt when I walk long distances. My knees are getting better (I still think I have some gait retraining to do). I’ve been able to squat lower than I could pre surgery. I think my hamstrings are still too tight to see the full results. I am very happy with my progress so far and it’s so early! Thanks Dr. Jason Joel Emer!